A former NYC high school teacher, Lisa is an American who is married to a Dane, had two kids in Kenya, and now lives in Tanzania. 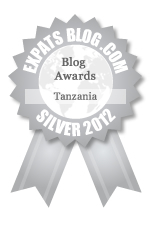 ExpatsBlog.com Expat Blog Awards 2012: Tanzania Silver Award! This blog won the Silver Award for best expat blog in Tanzania! One of my favorite blogs to read - Excellent balance of expat perspectives and cultural insight - all while having a "real life" approach. Great blog with awesome insights, fun times and struggles of how one American/Danish family lives in Tanzania. So interesting on so many topics: parenting, ex-pat daily living, African culture, travel, politics, etc. Always entertaining and real! I first read your blog in 2008. I find you focused and that you have kept your writing clear, easy to read and relate to . This has made your blog very engaging at all times. Thank you Lisa. If it were not for Lisa Welsein's blog her many fiends and relatives would spend several years worrying instead, we know she and the family are fine and as a bonus we have all learned a great deal about South Africa that may not be learned from a text book no matter how many you read. This blog is simply amazing, educational, funny, heartwarming and informative and while it is personal - it should, be picked up by some publisher so readers, in addition to friends and relatives, might have the benefit and privilege of this extraordinay narrative! I guess you might say I like it - NO I LOVE IT!!! Your Name Do you think this blog has what it takes to be listed at the top of Expats in Tanzania Blogs?